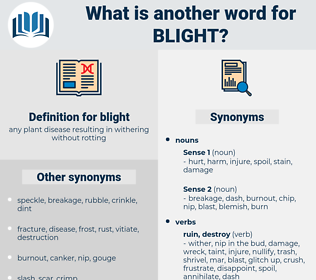 What is another word for blight? 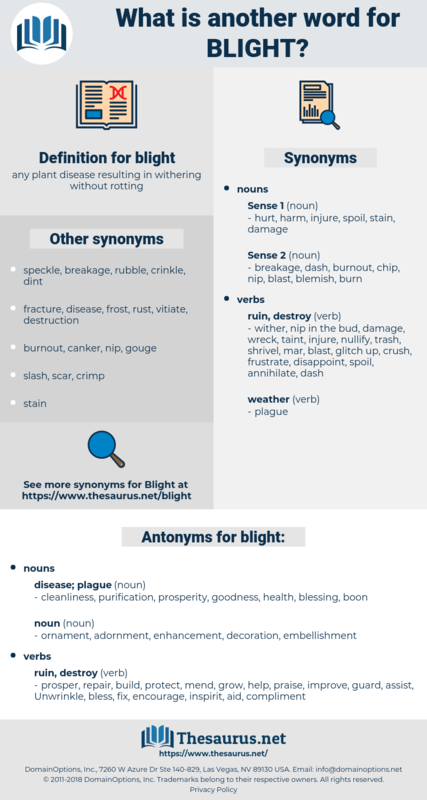 mildew, burning, blot, plight, disease. cleanliness, purification, prosperity, goodness, health, blessing, boon. ornament, adornment, enhancement, decoration, embellishment. prosper, repair, build, protect, mend, grow, help, praise, improve, guard, assist, Unwrinkle, bless, fix, encourage, inspirit, aid, compliment. You women in this Honey Fair, you pay your money to them Bankeses, which is the blight o' the place, and then you can't pay me. Then at the sudden thought of old Gradelle's fortune she again examined herself, and felt ready to throw the money into the river if such a course should be necessary to remove the blight which had fallen on the pork shop. head blight, apple blight, stem blight, coffee blight, potato mold, chestnut-bark disease, leaf blight, collar blight, halo blight, apple canker, halo spot, potato mildew, tomato yellows, potato murrain, potato disease, thread blight, twig blight, potato blight, bean blight, rim blight, beet blight, spinach blight, blister blight, walnut blight, tomato blight, chestnut blight, late blight, peach blight, alder blight, stripe blight, spur blight, cane blight, chestnut canker.